KIEV, Ukraine -- Ukraine's police chief and a prominent customs officer resigned on Monday, continuing an exodus of reformist officials that has raised serious doubts about the Western-backed government's commitment to tackle corruption. Chief of Ukrainian national police Khatia Dekanoidze quit on Monday. 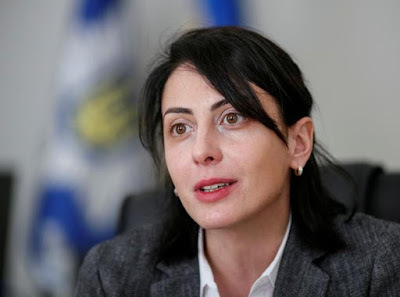 Police chief Khatia Dekanoidze, a Georgian who was appointed on the strength of her reforms as a minister in Tbilisi, said political meddling in appointments had thwarted her efforts to bring meaningful change. Yulia Marushevska, a 27-year-old who was appointed in 2015 to end rampant bribe-taking at the Odessa port customs, also resigned, accusing the government and her boss of blocking her reforms. Their departures are another blow to the leadership in Kiev, whose will to tackle corruption and vested interests has been repeatedly questioned since coming to power after the Maidan street protests in 2014. The resignations come just days after former Georgian president Mikheil Saakashvili quit as governor of the Odessa region, accusing President Petro Poroshenko of blocking his efforts to fight graft. Police chief Dekanoidze told a news conference there was a conflict in Ukraine between "those who want to change, and those who are stuck in the past." "I am asking, and even demanding, from the politicians and officials to refrain from interfering in the affairs of the National Police," she said. "They will have to understand that or be doomed to a new confrontation with society, sooner or later." Marushevska was parachuted into the customs service as a student activist by the president, after rising to prominence through a viral video she appeared in called "I am a Ukrainian" during the Maidan protests. She has repeatedly accused vested interests in state agencies of sabotaging her attempts to build a new headquarters, fire corrupt officials or introduce new software. "We have become hostages of sabotage, weakness, cowardice of senior government leaders and key officials," Marushevska told a news conference. A slew of other high profile reformers have quit or been dismissed -- many of them foreign-born officials brought in after Maidan. They include Economy Minister Aivaras Abromavicius, a Lithuanian, who quit in February, saying vested interests were blocking his ministry's work.